Featuring excellent sound quality, a 250­-entry phone book and innovative call blocking and management features, the Gigaset C620 Quint is a dependable family phone designed to help simplify your daily household routine. You can silence anonymous phone calls, blacklist up to 15 numbers and select a time-­based silent mode for those times when you don't want to be disturbed. If you're growing tired of unwanted disruptions from sales calls and other nuisance phone calls, the Gigaset C620 is the perfect solution thanks to its innovative call protection features. Additionally, the phone provides time-­controlled call silencing, a feature that also allows you to keep the phone on silent mode during the night or when your children are sleeping. Up to fifteen numbers may also be blacklisted, making this phone a great choice for those who consistently get calls from specific numbers that they don't want to hear from. The Gigaset C620 provides the convenience of a simple icon­-driven interface on its large, high- contrast colour screen. Offering enhanced productivity and the convenience of hands-­free phone calls, you can also pair any handset with the Gigaset L410 wearable speakerphone (sold separately). High sound performance is provided for both the earpiece and integrated speakerphone, allowing you to hold your phone conversations with crystal clarity. The Gigaset C620 is also a full-­featured baby monitor, and by selecting the baby phone utility from the on-­screen menu, you can choose a sensitivity level and have the phone alert you using either an external phone number or another handset in your house when your baby wakes up. 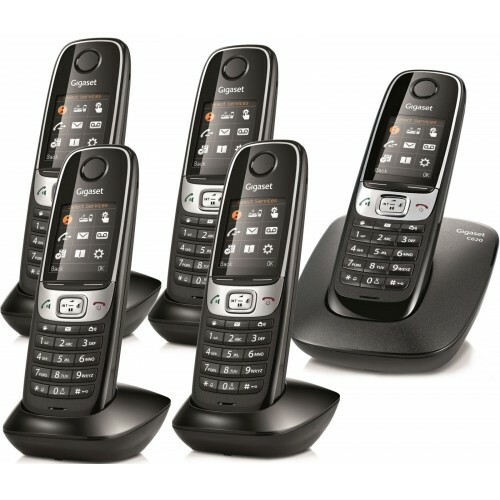 A convenient family phone, the Gigaset C620 Quint is an ideal set for larger homes with practical features, reliable range & excellent sound.